You can give blood at any of our blood donation venues in England. There are two types of donation venue where you can give blood - permanent blood donor centres and community-based venues. These are our most common type of blood donation venue and involve us setting up a temporary blood donation centre within your local community. These can take place in a number of locations – for example church halls, sports centres, mosques, football stadiums and hotels. Find your local blood donation venue and book an appointment. We usually visit these venues 2 or 3 times per year, but this can be more often, depending on the number of local blood donors. As well as thousands of local venues, we also have 23 permanent blood donation venues situated in towns and cities across England. These centres are open most days and often have better appointment availability. 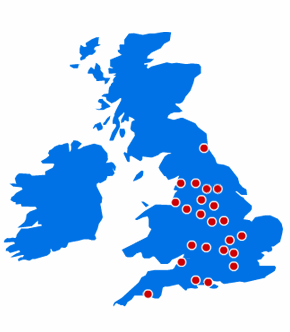 Click on your nearest centre below for location information and to book an appointment. We always need more people to give blood - register as a blood donor today.